A very nice villa villa with sea views for sale in Benissa coast. The living area is on one level and in good condition to live. There is a very large living room overlooking the pool and the Mediterranean coast. Also a large diningroom that leads to the kitchen. There are two double bedrooms and a family bathroom. The villa is located on a corner plot with a mature garden, the plant there is a garage and laundry room. This is a villa very well priced and worth seeing. 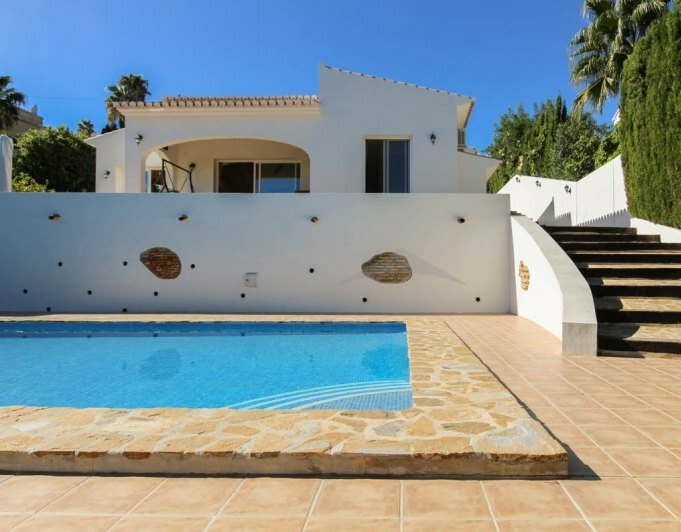 A charming spotless two bedroom villa for sale on the sought after Benissa Coast. 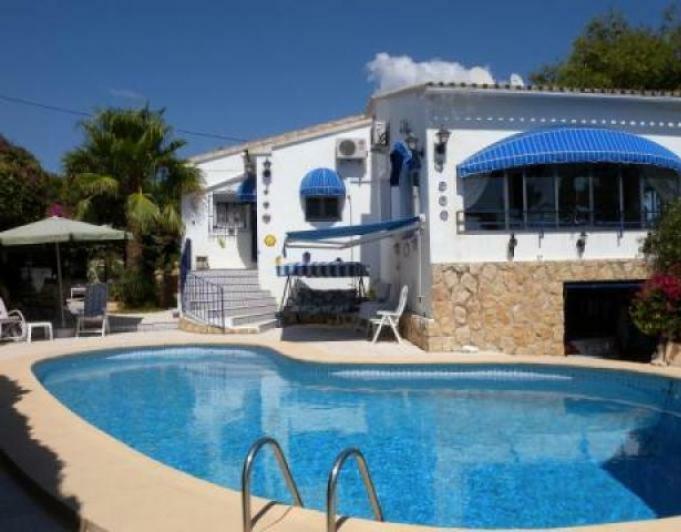 This truly is a lovely two bedroomed villa, as you drive up the driveway there are automatic gates that lead to a private parking area with a car port providing shade for a car. On the same level the principal entrance is found which opens up to a large lounge and a fully fitted modern kitchen, this is a bright and spacious area. From here you can lead out to a large covered naya and pool terrace. Also off the lounge there is an internal hallway leading to the guest bedroom, shower room and Master bedroom with an ensuite shower room. The Master bedroom has ample wardrobes and air conditioning. The garden is a Mediterranean style area, very well maintained with a low maintenance aspect. The property also benefits from an underbuild area which is ready to be converted into a third bedroom with the possibilities of an ensuite. 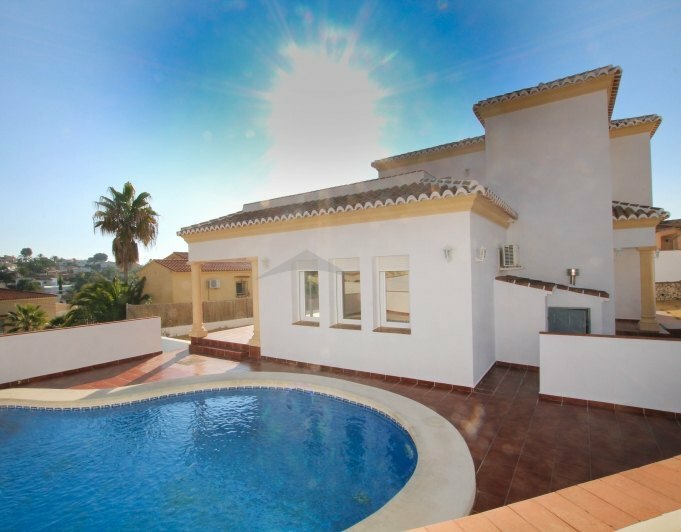 Villa for sale La FusteraA very well priced villa with options to develop more bedrooms if needed. 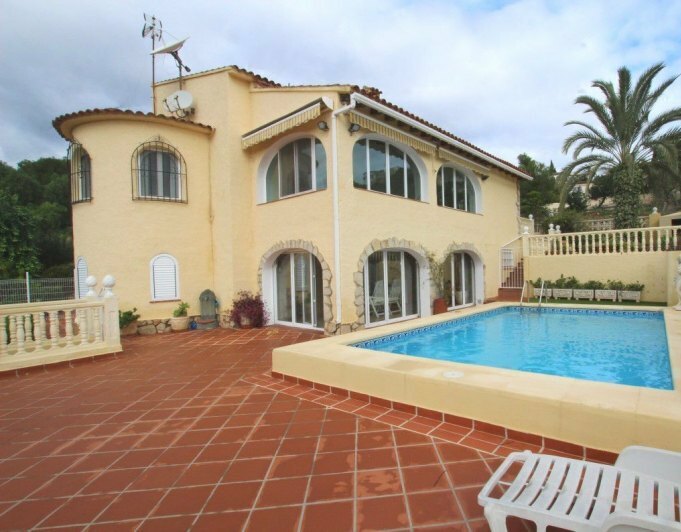 Located on a large plot with a lovely sea view, this villa is set on 2 levels. The top level comprises of a double bedroom with ensuite bathroom, a lounge with attractive log burner and dining area, kitchen with new cream units and a guest toilet. Here there is a large terrace to enjoy the views towards the Mediterranean. On the ground level there is a large 1 bedroom apartment which comprises of a double bedroom with walkin wardrobe, large shower room and kitchen with dining area. The naya here has been glazed for all year round use. Outside the pool area is attractive with various fruits trees and shrubs surrounding it. There is a garage and large storage room which could easily become another bedroom and part of the house. Extras include a large Satellite dish and a water deposit unit. 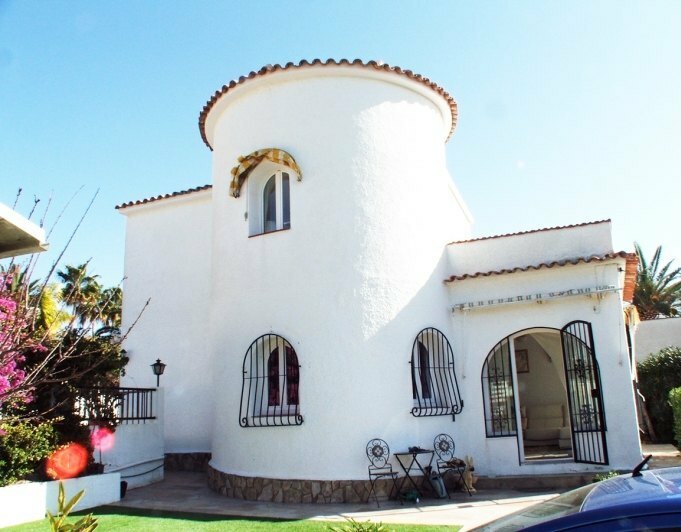 This villa has huge scope to have 2 additional bedrooms downstairs or to fit an internal staircase but as it stands is ideal for 2 families or for rental purposes. This beautiful property is set on a private 780m2 nearly flat plot within the area of Montemar in Benissa Costa, only a short drive to the nearest beach and close to all amenities, access can be either through the car gate which leads through to the parking area enough for 2 cars or through the pedestrian gate which leads down through a wheelchair friendly ramp down to the main entrance door of the property, a security door gives access to a bright entrance hall which divides the rooms on the ground floor and also fits the internal staircase to the first floor. On the ground floor we find an ample living/dining room connected to the american style fully equipped kitchen and has 2 sets of double glass doors out to the covered terrace on level with the pool, on this floor we also find 2 spacious double bedrooms with fitted wardrobes and 2 bathrooms (1 ensuite), via an internal staircase we go up to the first floor which comprises a large master suite with builtin wardrobes, large ensuite bathroom and 2 big private terraces with open views and some sea views.Outdoors the property has a private 8 x 4 m kidney shaped pool surrounded by a sunbathing terrace, easy to maintain gravelled gardens and a covered terrace with open views. The property boasts airconditioning hot and cold, double glazing throughout, security door, shutters on every door and window, oil central heating and beautiful views. Villa for sale in the popular area of San Jaime near to a golf course and amenities. In need of renovation, however offers an ideal investment opportunity. This two bedroomed villa could easily be turned into a three or four bedroomed villa. There is a ample room for a large swimming pool and terrace.Set on a private and peaceful plot with open views and with a small sea view. This 3 bedroom south facing villa located in Buenavista also benefits from an aditional guest apartment with one bedroom, bathroom, living area and kitchen. The property has lovely open views and sits on a large plot of 1300m2. There is a private pool and established garden. The main house consists of 3 good size bedrooms and 3 bathrooms, double glazed windows and central heating as well as air conditioning. The villa is only 1.5km from amenities. 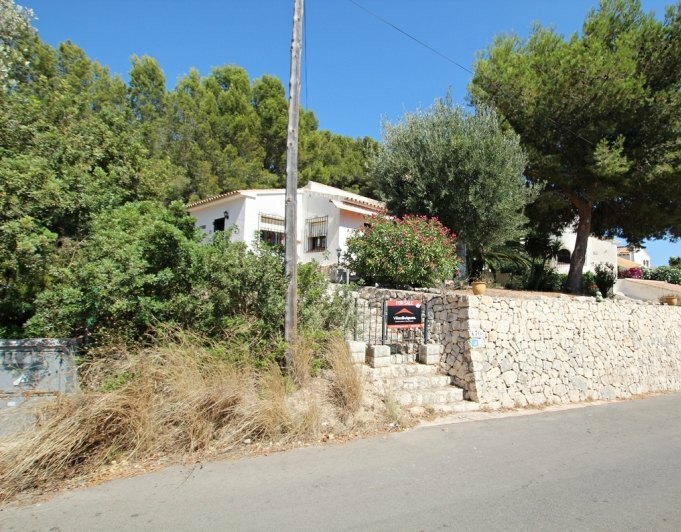 Three Bed Semi Detached Villa San JaimeExtremely well maintained and recently renovated semi detached villa in the much sought after area of San Jaime, Benissa. The views are wonderful even from the garden level and on the first floor, they are fabulous.Through the electric gates into the driveway with ample room for several cars, this villa is in pristine condition. The lounge is bright and of a good size and the well equipped kitchen is open with ample room for dining. There are 2 double bedrooms on this level with a family bathroom. Upstairs there is a lovely master bedroom with ensuite shower, walkin wardrobe and a delightful terrace to take full advantage of the sunshine and amazing views. The property is double glazed throughout and has gas central heating.There is a lovely artificial grass area for children to play safely and the pool is 7x4m. There is a shed for storage and a BBQ and dining area. Close to all amenities, a golf club and only a few minutes drive to the beach, this private property is ready to move into. Chalet Costa de Benissa sale Villa sale Benissa Costa. A large villa with gardens and sea views. This villa for sale is in a very central location, close to Moraira, Calpe and Benissa overlooking the sea through Ifach rock and Moraira. The upper part of the villa consists of 3 bedrooms and 2 bathrooms, large lounge / dining room, sunroom with stunning views and a separate kitchen. The bottom is provided as a separate apartment with 2 bedrooms and 1 bathroom, lounge and separate kitchen. There is also a laundry on this level room. There is a large garage with capacity of 3 cars and a lot of storage. The property has air conditioning cold and hot, completely safe and private garden with high walls around and facing South. There is a very mature garden to enjoy. The Moraira area guide is undoubtedly one of the most beautiful villages of the Costa Blanca. Situated on a Bay with breath taking panoramic views over the Mediterranean Sea and located between the sea and the mountains, this stunning fishing town is located. The atmosphere is of relaxation and tranquility, with a Marina, an excellent selection of elegant shops and a weekly open market. There are many restaurants and bars in the area that offers traditional cuisine Moraira town and Spanish Navy with fresh fish and paella to be a specialty. There's a strong sense of culture and tradition in Moraira and, along with many other Spanish cities, there are many festivals held to preserve its history. Historical Portet Bay was once a refuge for vessels and the Tower of the Cap d'Or is located at the highest point of Cap D'Or (Golden Cape) and was used as a legacy of protection against attacks from the Berber pirates in the 6th century. A large drive way with enough room for 3 cars takes you to the entrance of the villa through the top level, where we find a very light living/dining room area which accesses the covered open Naya and an open plan kitchen, on this level there are 2 double bedrooms and 2 bathrooms (one of them ensuite).On the lower level with internal access there is a second lounge, 3 double bedrooms and one family bathroom. From the living room on this level there is direct access to a second covered naya and to the garden where we will find a large 100 m2 terrace with a private 8 x 4 m swimming pool. Property boosts gas central heating, wood burning stove, double glazing through out, some electric blinds and good parking. Large detached villa with sea views in the area of La Llobella, Benissa Costa, near La Fustera Beach. Accommodation is divided in two spacious apartments with independent access but there exists the possibility of having them internally connected.Access into the main accommodation can be either through the large double garage with electronic door and internal access to the house or through the security entrance door which leads into a big glazed in Naya from which we find the best views across to the sea, from here we have a set of wooden doors with glass into the living room/dining room, straight ahead there is a separate fully equipped kitchen and utility room. On the right there is a hallway with storage cupboards which distribute the 3 double bedrooms and 2 bathrooms (1 Jack and Jill), the master bedroom also boosts a large walkin wardrobe.On the lower level we find a spacious glazed in naya on level with the pool with bifolding doors to be able to open up the room totally, from here there is access to 2 large double bedrooms, 2 bathrooms (1 ensuite) and a large separate fully fitted kitchen.By the pool we find a large terrace with barbecue area and further access to a variety of terraces. On the top of the house there is a solarium terrace and big storage room.The property benefits of double glazing throughout with persianas, gas central heating, large double garage with electric door, sea views and a lot of privacy. A charming home with lots of character.This is a well presented four bedroomed villa, with three bedrooms on the principal living level and a further bedroom in an independent large apartment on the lower ground level.Set within the popular and sought after area of the Benissa Coast and on a quiet peaceful residential road.Entering the property through the automated driveway gates you have access to the ample off street parking and then on to the delightful Naya/Covered terrace which circles half of the property. An ideal area for alfresco dining or just to simply sit back and relax away in the southerly sun light.The main entrance to the house is found just off the Naya and takes you through to a large and bright dining room and an equally grand and luminous lounge with an area off to the side, perfect for a small office area. The lounge has a brand new log burner and double patio doors leading out to the Naya area.The fully equipped kitchen is accessed from the rear of the lounge, finished to a high quality with good design of kitchen units and silistone work tops.On this same level there are two guest double bedrooms, each with built in wardrobes and the shared use of a large, luxury bathroom boasting heated towel rail and a modern vanity unit.The Master bedroom with ensuite is found on the upper level of the property. An ample sized main bedroom and again with builtin wardrobes. The complete en suite bathroom is also finished off to a high standard. A great plus of the main bedroom being the private balconyterrace inviting you to relax and enjoy your breakfast in the morning sun. From this terrace a decorative spiral stair case leads up to a large roof terrace.On leaving the principal living area you can head down the wide and flowing steps to the ground level to a utility room and storage area. From here you can gain access to an independent apartment which comprises of a large open plan lounge and kitchen area, a Jack and Jill bathroom leading of the large double bedroom of this floor.There is also the possibility to knock through the rear internal wall to create more living accommodation. The private and peaceful garden area is wellmaintained with secluded sun lounging areas and a covered BBQ, with seating area. The 8m x 4m swimming pool is also very private and surrounded by a lush garden with a variety of fruit trees and shrubs.This is truly a lovely property set in a peaceful tranquil location, full of charm and has been set at a sensible selling price. This luxury villa is located within the area of San Jaime in Benissa Costa, only a short stroll to the local Golf Course and a large variety of amenities. Access is through the pedestrian gate that leads us to the front door of the property which takes us into the upper entrance hall, on this level the property has 3 double bedrooms (one with Access to a private balcony) and one guest bathroom.On the lower level there is a big open plan living/dining room with a set of glass double sliding doors leading out to the pool terrace and the covered terrace, on this level we also have a double bedroom, a second bathroom and an open plan kitchen with all fitted appliances and a glass door leading out to the stunning outside space.This property boosts of panoramic sea views, oil central heating, airconditioning hot and cold, double glazed Windows throughout, alarm system and a private 7 x 4 m heated pool. A villa with sea views located in the distance walking Baladrar Beach and all amenities. The villa is on two levels. The main floor has two double bedrooms with dormitory network having ensuite bathroom kitchen living room. Below is a two bedroom one bath apartment. The villa is oriented to the South, with stunning panoramic views. There is gas central heating through out, air conditioning, solar panels for water heating. 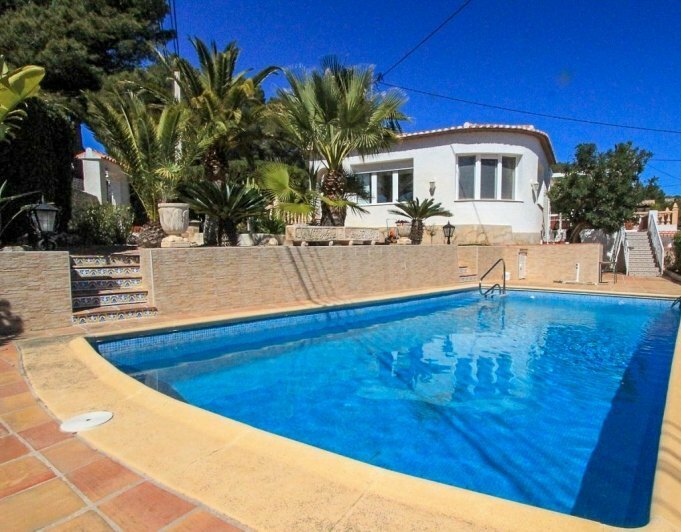 This large villa for sale is set in a quiet residential area close to Moraira, Calpe and Benissa and offers large family accommodation with a business opportunity if desired. Set on a double plot.A unique opportunity without question. The property comprises of 4 bedrooms on the main floor. The master bedroom has a large ensuite bathroom with jacuzzi bath. The kitchen is modern and well equipped. There is a large lounge and dining area and from here there is a lovely naya to enjoy the sunshine with sea and mountain views. Downstairs there are 2 further bedrooms with kitchen. Also on the ground level there is presently an area used as a gym/sauna/beauty treatment business. Outside the pool area offers a lovely space to relax and enjoy the outdoor lifestyle. A traditional villa set in the popular area of Montemar on the Benissa Coast line. This two bedroomed villa has an undisturbed panoramic sea view. Benefitting from a double plot with twin access. This is an ideal property to extend and refurbish turning it into a new modern villa.